Much of the information you are looking for may already be available on our website. 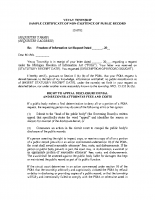 The Michigan Freedom of Information Act (FOIA) (MCL 15.231-15.246) provides for public access to certain public records, permits the charging of prescribed fees and deposits, and provides remedies and penalties for non-compliance. A person has a right to inspect, copy, or receive copies of certain requested public records. Some public records are permitted or required not to be disclosed. 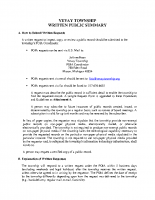 Vevay Township is a public body that must comply with the FOIA. 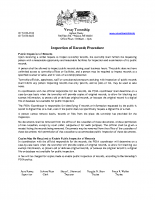 The township has established Procedures and Guidelines to implement the FOIA effective July 1, 2015 and can be found on this page. For purposes of these Procedures and Guidelines, terms have the same meaning as defined in the FOIA. 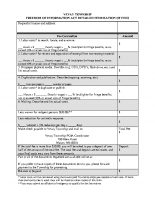 A complete copy of the FOIA is available on the Michigan Legislature’s website. Vevay Township is a “public body,” as defined in Section 2 of the Michigan Freedom of Information Act (FOIA), MCL 15.232. It is the policy of Vevay Township to comply with the FOIA. 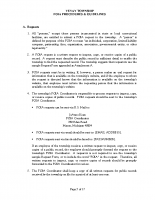 The Clerk is the public body’s FOIA Coordinator and is delegated the authority and responsibility to establish written procedures and guidelines, a written public summary of the procedures and guidelines, and a detailed itemization of fees form in compliance with the FOIA, as amended effective July 1, 2015 (2014 PA 563); provided, however, that the procedures and guidelines shall not provide for fee appeals to the board.